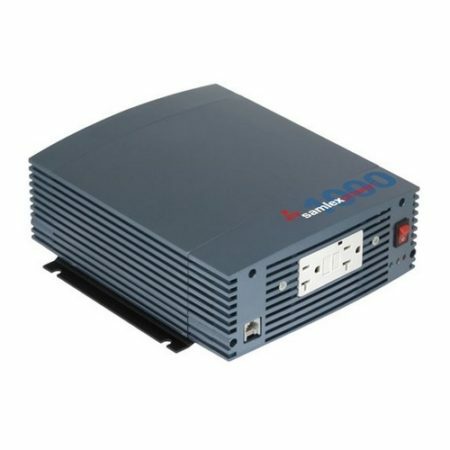 When it comes to a quality power inverter, look no further. Samlex products are the best on the market and built to last. Ideal for powering your electronics or appliances in your car or truck, Boat, RV. This power inverter takes the aggravation away from having to plug your devices into different outlets. Our Pure Sine Wave SSW line of high quality inverters will convert 12 VDC to 115 VAC at an output frequency of 60 Hz. All New design, compact and lightweight models feature soft start technology and 2X the surge protection. Advantages of a Pure Sine Wave Inverter vs the Modified Sine Wave Inverter. The output voltage of a sine-wave inverter has a sine wave-form like the sine wave-form of the mains / utility voltage. Please see sine-wave represented in the Fig. 1 and Fig. 2. Fig. 1 shows modified sine-wave and square wave for comparison. In a sine wave inverter, the voltage rises and falls smoothly with a smoothly changing phase angle and also changes its polarity instantly when it crosses 0 Volts. In a modified sine wave, the voltage rises and falls abruptly, the phase angle also changes abruptly and it sits at 0 Volts for some time before changing its polarity. Thus, any device that uses a control circuitry that senses the phase (for voltage / speed control) or instantaneous zero voltage crossing (for timing control) will not work properly from a voltage that has a modified sine wave-form. 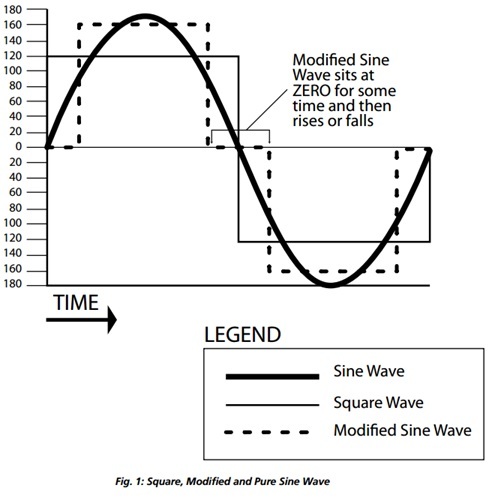 As the modified sine wave is a form of square wave, it is comprised of multiple sine waves of odd harmonics (multiples) of the fundamental frequency of the modified sine wave. For example, a 60 Hz. modified sine wave will consist of sine waves with odd harmonic frequencies of 3rd (180 Hz), 5th (300 Hz. ), 7th (420 Hz.) and so on. The high frequency harmonic content in a modified sine wave produces enhanced radio interference, higher heating effect in motors / microwaves and produces overloading due to lowering of the impedance of low frequency filter capacitors / power factor improvement capacitors. The output wave-form is a sine-wave with very low harmonic distortion and clean power like utility supplied electricity. Inductive loads like microwaves and motors run faster, quieter and cooler. Reduces audible and electrical noise in fans, fluorescent lights, audio amplifiers, TV, fax and answering machines. Prevents crashes in computers, weird print outs and glitches in monitors. Note :Damage may occur in these devices without the correct inverter. Laser printers, photocopiers, magneto-optical hard drives. Built-in clocks in devices such as clock radios, alarm clocks, coffee makers, bread-makers, VCR, microwave ovens etc may not keep time correctly. Output voltage control devices like dimmers, ceiling fan / motor speed control may not work properly (dimming / speed control may not function). Sewing machines with speed / microprocessor control. Transformer-less capacity input powered devices like Razors, flashlights, night-lights, smoke detectors etc…Re-chargers for battery packs used in hand power tools. These may get damaged. Devices that use radio frequency signals carried by the AC distribution wiring. Some new furnaces with microprocessor control / Oil burner primary controls. High intensity discharge (HID) lamps like Metal Halide lamps. Some fluorescent lamps / light fixtures that have power factor correction capacitors. Inverter shut down may accur indicating overload. Visit our Blog to learn more about how this type of inverter works and how to interpret the specifications listed above. Advantages of a Pure Sine Wave Power Inverter vs the Modified Sine Wave Power Inverter. Be the first to review “Samlex 1500 Watt Pure Sine Wave Inverter SSW-1500-12A 12 volt” Click here to cancel reply.